My favourite sort of gossip is the kind people spill about their home towns. Sometimes it’s the traditional kind of people-gossip; sometimes they’re barely aware they’re divulging secrets. She didn’t finish with a Southern “bless their heart,” but it was understood. Fernandina Beach on Amelia Island was named in 1811 in honour of King Ferdinand VII of Spain, but the first (recorded! Fernandina reminds us) European explorer arrived here in 1562. It’s a sweet little shrimp-fishing port town with active rail running between the marina and a strip of buildings that — if they aren’t truly the first in the country, certainly come close. The depot facing the water was built by the Florida Railroad Company in the 1850s and was part of the first cross-Florida railway. It was completed — ending at the Gulf of Mexico — one month before the beginning of the Civil War and just ahead of Fernandina putting up the last of its infamous eight flags: that of the United States of America. It had previously served under the banners of the French, Spanish (twice), English, Patriots, Green Cross of Florida, Mexican Rebels, and Confederates. But what of Jean Ribault, the French Huguenot who was the first to record a visit to Fernandina? He and 350 other colonists were slaughtered three years later by Spanish forces under orders from Pedro Menendez de Aviles. Menendez is among three men — the others are Juan Genopoly and Henry Flagler — who were instrumental in the early growth of St. Augustine, which is about 100 kilometres south of Fernandina and also lays claim to being the oldest permanent European settlement in North America — and its most charming. 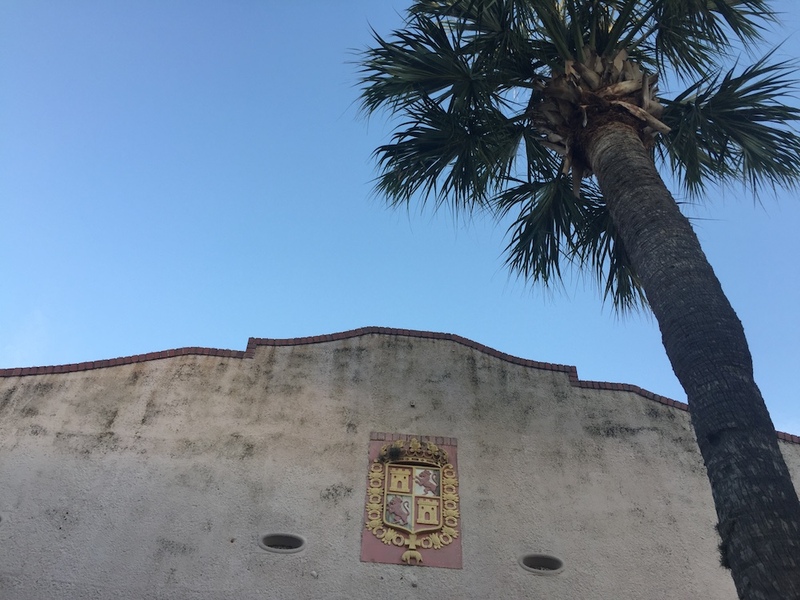 St. Augustine isn’t shy about its claims and is quirky in a touristy way, with an old-fashioned town square and a narrow pedestrian alley through a thick stone gate, flanked by ancient buildings. Menendez is said to have landed on St. Augustine’s feast day — he and his 600 men cleared out the aboriginal village and put up stone walls in the name of King Philip, who had ordered the colonization. It was 1565, more than 50 years before the Mayflower arrived at Plymouth Rock. Greek carpenter Ioannis Ioannopolis, known as Juan Genolopy, made his mark more than 200 years later. He purchased land in the late 1700s and set to building a home dedicated to education — his daughter Mary would be its first teacher. Their early mission was to teach English to Greek, Italian and Corsican Minorcans, most of whom were indentured servants who had fled to St. Augustine from indigo plantations. They had walked more than 100 kilometres to this refuge, and the area around the schoolhouse, inside the walled city, became a sanctuary for Minorcans who had been abused by the plantation owners. Genolopy’s cyprus and cedar home stands, and it is the oldest schoolhouse in Florida, and one of the oldest in the United States. Railroad tycoon Henry Flagler is credited with developing modern Florida. He’d been in the salt and grain industries, and he had collaborated with John D. Rockefeller to develop Standard Oil. He was a self-made millionaire breaking into the railway and luxury hotel game. He moved from New York to Florida in the second half of the 19th century for the health of his ailing wife, who died despite the warm ocean air. When he remarried, he and his new wife visited St. Augustine and though they found it a lovely village, they were dismayed to find there were no nice hotels, nor pleasant ways to travel there. Flagler knew an opportunity when he saw one: He bought the Jacksonville, St. Augustine & Halifax Railroad and built the snazzy 540-room Hotel Ponce de Leon. He then built hotels and laid rail all the way down to Miami, and onward to Key West. He died after falling in his home at 83. He is buried in St. Augustine. For at least a thousand years before Europeans showed up, all of this belonged to Indigenous peoples. Though there were tens of thousands of people in scores of tribes throughout Florida and Georgia, they shared a common language and were called the Timucua. They called this land Napoyca. The Europeans arrived, introduced disease and warfare and butchered the aboriginal people. By 1700, there were fewer than 1,000 left. Within 150 years, the Timucua would be extinct.